Parade deck at Marine Barracks Washington. 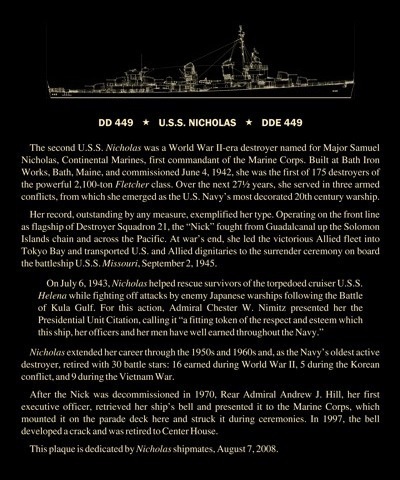 The Marines’ selection of a permanent location to display Nicholas’s ship’s bell with a descriptive plaque presented several opportunities. A first consideration was preparing the 60-lb. bell. During wartime, naturally, reflection was something to be avoided, so the bell spent much its early years in “Nick” in a dulled state. Also, bronze oxidizes as it weathers and gains a brown or greenish hue, as had occurred since 1997. Plaque dedicated 7 August 2008 with Nicholas’s ship’s bell at Center House, Marine Barracks Washington. McShane Bell Foundry of nearby Glen Burnie, Maryland was an easy choice to recondition and clear-coat the bell to restore and protect its mirror finish. On receiving the bell, McShane’s Bill Parker’s first impression was that McShane, itself, might have produced it in 1942. As such, it would have been cast from Naval grade bronze, a nearly indestructible material. On realizing that the reason for the bell’s retirement was its hairline crack, however, Bill reconsidered: this could not be Navy bronze. Rather, it is a church bell-grade alloy of 80 per cent copper and 20 per cent tin which, when struck (if not cracked), produces a more beautiful sound. Well might the bell have been popular during parades at 8th and I until, perhaps, it was struck harder than church bell bronze can stand! Bill had a possible solution; while recasting the bell would be the only way to permanently restore its original sound, a welding rod might patch the crack. Some discoloration in the vicinity of the crack could be expected and the durability of the patch would be uncertain, but the bell could possibly be rung again in its original voice. Marines’ and shipmates’ intent is preservation of the bell for its symbolism rather than its sound, however, so McShane completed the restoration. The Marines’ decision to mount the bell on a column inside Center House determined the plaque’s design. Using a line drawing offered by A. D. (Dave) Baker, III (prepared in 1980 for the cover of the original edition of Norman Friedman’s book U.S. Destroyers, an illustrated design history) with text worked out between Nicholas shipmates and the Marines, Novacolor of Ogden, Utah (a supplier to the National Museum of the Pacific War, Fredericksburg, Texas) prepared an anodized aluminum plaque to complement the appearance of the bell. On 7 August 2008, Nicholas shipmates, family members and friends gathered at the Marine Barracks Washington. Following a tour of the barracks and the Home of the Commandants, where they viewed the portrait of Samuel Nicholas, they participated in a ceremony at which the refurbished bell was unveiled, a ceremonial bellrope attached and the plaque dedicated. Speaking on behalf of Nicholas shipmates were World War II officers John Stone and Warren Gabelman. Capt. Antony Andrious and Sgt. Quinby Akal, Public Affairs; Dennis Martin, Facilities Manager and crew; Tom Wilkerson (MajGen USMC Ret.) and Paul Skrabut (USMC Ret. ), McShane Bell Foundry, Miles Enterprises and Vince Brennan at Frayed Knot Arts for his magnificent bell rope.